I have been getting some quilting done this summer. I love what I did on this quilt. She gave me free rein to do as I please. She was saying she liked swirls of some kind and I can up with the rest. 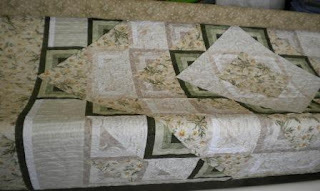 She used the Hobbs wool batting so the quilt looks more quilted and puff then the cotton batting most customers pick. Here is the center area of the quilt. I placed a large daisy in the center. All of the quilting is done by free motion with out any marking or patterns. This gives you a idea of what the over all quilt looks like. It is still on the frame here. I have two quilts on my design walls and there is no other place to get a photo quickly except the frame. 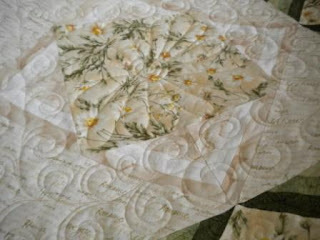 I best get back to quilting I have to get another one done quick quick. 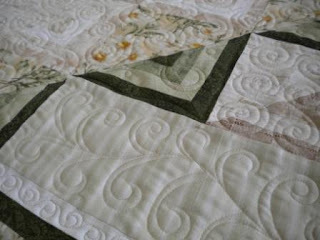 That is great ; I hope to have a couple of quilts for you to do this fall if you have time. They are going to be too big for my frame. Hi! Greetings from Finland! I love the quilts! They are fantastic! Congratulations! It's so nice to see quilters from the other side of the world!!! Have a nice day!